Blogging started in the late 1990's and over the last 15 years or so, has become a worldwide craze. Individuals originally used this tool as a way to express themselves in cyberspace. It was a way for people to portray their own unique thoughts and feelings on a variety of subjects, life being one of the most prominent. In effect, a blog was originally a kind of online diary, used by everyone from travellers to war veterans. Would you like to improve your SEO rankings? The era of the blog has evolved now though and this medium is becoming not only more useful, but almost essential for efficient marketing. All imaginable businesses from family run corner shops to Fortune 500 corporations have recognised the efficiency of the blog post and what it can do for their companies. Releasing fresh content onto the web on a regular basis can dramatically improve that company's search engine rankings. Writing in lists is a thing of the past and is now considered a lazy tool of the weak mind. Blogging offers so many more advantages. 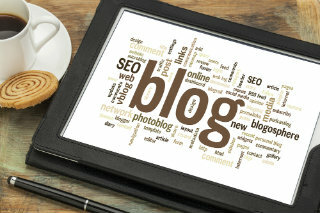 Unlike lists or landing pages, blogs offer more versatility in terms of content. They are generally more informal and can often be used to speak in first person, which gives customers the reassurance that they are buying their products from a business who actually cares about its customers. Even touches of humour can be woven into blog posts, making them fun to read and this in turn will keep customers interested. One of the most important aspects of business blog posting however, is to maintain a relatively high density of keywords. If you own a restaurant business for example, including keywords such as food, dining, buffet and meal times are generally quite appropriate. You can find the most searchable keywords in your industry on Google Keyword Planner and apply them onto your blogs. Changing your blog content regularly will keep search engines on their toes and will increase your online presence in an every expanding digital community. Even if writing isn't particularly your strong point, there are hundreds of professionals who understand the importance of keyword density and SEO, as well as having the creative flair needed to take you blogs to a new level. Kommand offers you a great blog service which can be added to your website. You can create your own website in a few hours and add the best web practices to boost your SEO and attract your target audiences. What are you waiting for? Click here and get creative! Blog away and be an architect of your own business future.